Charlie ‘Snowy’ Parsons was a true journeyman of football, and his record of success across the length and breadth of Australia is a remarkable story. He spent two seasons at Princes Park at the height of his career, during which he was one of Carlton’s best players in our narrow loss to Richmond in the 1929 Preliminary Final. Parsons began his football as a schoolboy at Melbourne High School, and spent a season with Ripponlea Cadets before moving back home to Warracknabeal in 1921. That move proved to be the cornerstone of his football career, because in just his first season with local club Imperials, he played in a Premiership. Several more flags followed during the twenties, and in 1928 - while playing on the MCG for a representative Wimmera side against Gippsland - he came under notice of VFL clubs scouting for talented 'bushies'. By that time Charlie was running a successful family grocery and general store, so the lure of leaving his beloved home town would have had to have been substantial. Notwithstanding that, he was wooed by several clubs including Essendon, Hawthorn and Footscray. But in the end it was the Blues who won the day, and gained Charlie’s clearance on the promise that he would be given a position with a leading Melbourne grocery firm. When he arrived in the Victorian capital however, Charlie was told by the firm that nothing was known of him, or indeed, any promise of employment. Carlton would not grant a clearance back to the Imperials, so Charlie was left to make the most of what had become a difficult situation. Happily, the problem was amicably resolved, and Charlie made an impressive debut for the Blues against Essendon at Princes Park in round 1, 1929. At Imperials, Charlie had made his name as a strong-marking centre half-back, but at Carlton he took up a half-back flank alongside Alex Duncan and Fred Gilby. All three were more than capable key defenders, and for the next twelve months, Carlton’s first line of defence was one of the best in the competition. Throughout his first season in Carlton’s number 27 guernsey, the pacy half back with champagne-coloured hair impressed Carlton supporters and VFL pundits alike. His speed was very good for his size, while his dashing downfield runs and well-timed punches were appreciated by his team-mates and supporters alike. He experienced the thrill of finals football in his first year, and seemed set for a long stay at Princes Park when injury kept Alex Duncan out of the 1929 Preliminary Final. Charlie moved across to the key defensive post, and was heroic for the Blues in a narrow and desperate 6-point loss. Those days at a big city club were exciting for the young man, with exhibition games in Tasmania, Queensland and New South Wales allowing him to see many parts of Australia. He also experienced more representative football when he was among the best on ground for a VFL team against a Bendigo Football League side. However, it was not football, but his professional career which would eventually determine Charlie’s destiny. At the end of 1930, the company with which Charlie had found employment transferred him to South Australia, and the next chapter of his life began. Mindful of past events, Carlton reluctantly agreed to let Charlie go. In 1931 he settled into his new position as the manager of Griffiths Bros Tea Company, and was welcomed warmly into the Sturt Football Club. Over the next six years, Charlie served the Two Blues magnificently. 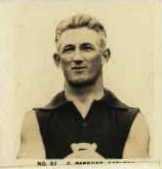 In five seasons as captain, he led the club to the 1932 SANFL Premiership and represented South Australia on five occasions - including one memorable match where, as vice captain against Victoria, he ended up at full back on the legendary Gordon Coventry. In the late thirties, a work transfer again had Charlie moving interstate, this time to Western Australia, and a brief stint as captain-coach of Claremont in the WAFL. Another move found him outside of Perth as captain-coach of the York Football Club, where he became the toast of the town when he led the team to its first Premiership in 20 years. Charlie stayed at York until the outbreak of hostilities in World War II, then immediately returned to Victoria and enlisted for active service. Throughout five years in uniform, Charlie’s leadership qualities were reflected in a steady rise through the ranks. When the guns eventually fell silent in August 1945, he was serving at the headquarters of the 1st Australian Army Corps, with the rank of Lieutenant. After the war, Charlie went home to Warracknabeal as non-playing coach for one last season in 1946, and narrowly missed yet another Premiership. So, after a playing career that spanned eighteen years and every state of Australia, he left the game with an untarnished reputation for skill and fairness. He never played in a team that finished lower than fourth on the ladder, and was never reported. Contributors to this page: Bombasheldon , PatsFitztrick , molsey , tmd1 , Jarusa , dgreen2 and admin . Page last modified on Sunday 04 of March, 2012 08:02:39 AEDT by Bombasheldon. 1976 Prelim Final - Match Preview.